Hearing First has a free download of a simple list of conversation starters and a topic to focus on with open-ended thinking and feeling comments and questions that will help your child develop the skills of understanding the meaning behind actions and events and recognizing the perspectives of others in social interactions. Click HERE. 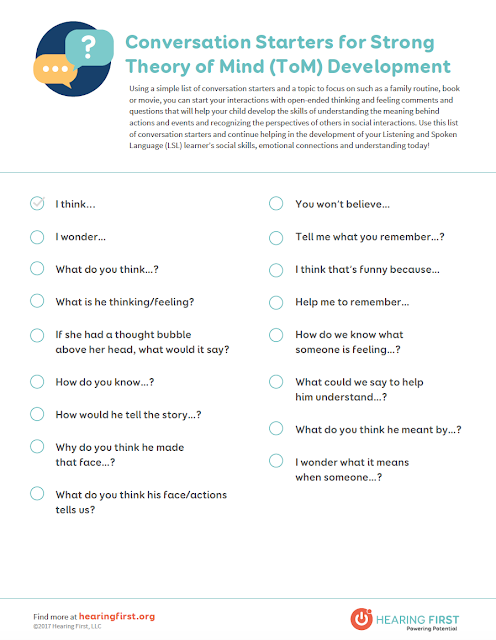 Use this list of conversation starters and continue helping in the development of your Listening and Spoken Language (LSL) learner’s social skills, emotional connections, and understanding today!